Your car’s electrical system is a complex network that requires special diagnostic equipment for proper servicing. When your vehicle is suffering from electrical problems, bring it to the skilled technicians at Cartech Automotive & Transmission Repair. At our full-service repair shop, our professionals can access your car’s data via its onboard computer and identify the exact cause of any electrical problems. You can always expect our specialists to provide you with a high level of workmanship when you request an auto electrical repair in San Antonio, TX. When it concerns your inoperative vehicle, time is money. That’s why our team is committed to helping you get the most value from your car, truck, or SUV with a top-notch electrical repair that puts you back on the road quickly. Using strategy based diagnostics, we’ll assess everything from car batteries to the complex computer systems that control your safety and security features, ignition control, air conditioning systems, and more. 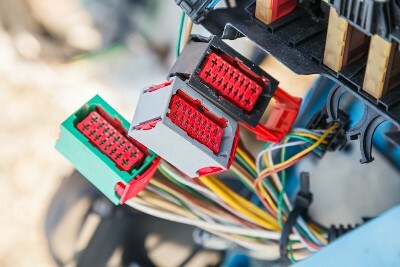 A vehicle’s electrical components are integral to almost every system onboard. Our experienced technicians will run a specialized diagnostic on your vehicle’s electrical systems to determine the malfunctioning components and their necessary repairs. Whether we’re called to restore auto alternators, batteries, starters or other crucial components, you can rest assured that we’re more than ready to handle your repairs in full. As is the case with all auto electrical repair work, our expert mechanics will follow a strategy based diagnostics approach to address your needs quickly and properly. It all starts with a thorough assessment of your battery and wiring systems. Warning lights signal many electrical problems on your dashboard. Letting us know what warning lights you’ve noticed flaring will alert us where to start. If you notice any warning lamps lit up on your dash, reach out to our specialists immediately and allow us to get to the bottom of your electrical issue. As motorists ourselves, our mechanics understand that you have pressing matters to tend to. That’s why we make a point to complete your electrical repairs as quickly as possible, without sacrificing our commitment to quality. Reach out to our specialists for a complete diagnosis to determine the extent of service needs and we’ll get your repairs underway as soon as possible. Contact our auto shop for electrical repairs that keep your vehicle running at peak performance. We proudly serve drivers in San Antonio, Helotes, Leon Valley, Pipe Creek, and Bandera, Texas, and the surrounding communities.